Dr. William (Bill) ’64 and Gerrie ’63 Hansford have served on the Dean’s Leadership Council since 2007. The couple met when they were 13 years old at Blue Lake Methodist Camp in Andalusia, Ala. Following his work with drug-dependent youth, the Hansfords moved to Arizona where Bill worked with the U.S. Public Health Service on a Navajo Indian reservation. In the 2007 edition of Journey magazine, COSAM’s yearly print publication, Bill described working closely with the medicine men on the reservation. Bill provided primary care to the Navajo and describes it as one of the most rewarding experiences of his life, an experience that changed the trajectory of his medical career. He left Arizona to begin an ophthalmology residency but quickly realized, based on his enjoyment of working closely with the Navajo and building personal relationships, he was better suited for family practice. As a result, he completed a Lloyd Noland residency training program in pediatrics, which included intensive care neonatology, pediatric hematology and pediatric neurology at The Children's Hospital of Alabama. 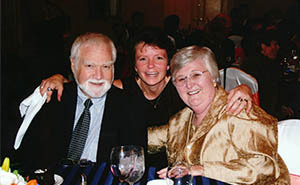 He then established a family practice in Opp, Ala., where he worked for nine years. The Hansfords then moved to Birmingham, Ala., where Bill served at Lloyd Noland Hospital as a staff physician and medical director of Family Care Outpatient Clinics and later as chairman of the Department of Family Practice. After working four years as a part-time physician advisor in Health Management, he joined Blue Cross and Blue Shield of Alabama as a medical director. Gerrie’s background is also in the medical field, and before “starting her main career as a mother” she completed a one-year internship at Carraway Methodist Hospital in Birmingham, was a board certified medical technologist through the American Society for Clinical Pathology, and had special training in blood bank technology at Ortho Pharmaceutical in Raritan, N.J. She also led the effort to have the blood bank at Carraway Hospital certified by the American Association of Blood Banks. 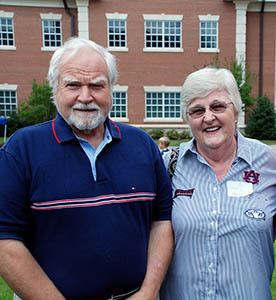 The couple’s common background in medical science is the driving force behind their support of the college. 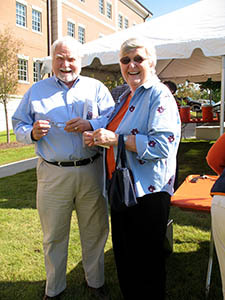 The Hansfords are also members of the 1856 Society and the Petrie Society, as well as Life Members of the Auburn Alumni Association. Beyond financial giving, Bill takes a personal interest in the pre-biomedical sciences students at Auburn and volunteers his time by talking to undergraduates in Alpha Epsilon Delta, the pre-health honor society, in large-group settings as well as one-on-one, imparting some of the wisdom he has accrued during a career that has spanned nearly 45 years. Bill is originally from Andalusia and Gerrie grew up in Luverne, Ala. They have three grown children, Anne, Amy and William, and five grandchildren, Jay, Ellie, Cass, Cooper and Neva. The couple resides in north Shelby County in Birmingham, and they attend Canterbury United Methodist Church where Gerrie started a group called the “Knit Wits,” a prayer shawl ministry. In addition to knitting, she enjoys needlework, reading, travel, and spending time with their children and grandchildren". reading and needlepoint. Both are involved in Bible study groups and enjoy their enormous collection of Navajo art that is displayed throughout their home. 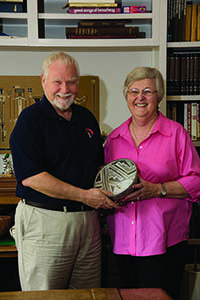 Bill’s hobbies include growing camellias, gardening, reading, studying, traveling, collecting Indian artifacts, collecting antiques and collecting art paintings. He also enjoys studying architecture and designing buildings and building additions. For more information on the Dean’s Leadership Council, contact the COSAM Office of Development at 334.844.2931.